Jack joined up on the same day as two of his best friends from school and three of his work mates in Bristol in early September 1914. There had been an enormous queue to sign up but they had all sailed through the medical and had soon been on their way, proudly marching off to war. Born in Yate, where his mother Mary runs the Post Office, Jack had been training to be an engineer. He had won a place at grammar school and begun an apprenticeship at a Bristol firm. They have promised to take him back at the end of the war. Jack’s father had been proud of him but since his death before the war, Jack feels that by enlisting he can live up to being the new head of the family by defending his country in France. During his training it was clear that Jack had a flare for signals, he loved the new technology and working out ways of getting the equipment to work in challenging situations. As part of the 5th Division, Jack has proved himself to be a good honest soldier and a credit to the Gloucestershire Regiment. Before the Franco-British offensive on the Somme began the 5th Division was enjoying a period of rest and re fit at GHQ Reserve. 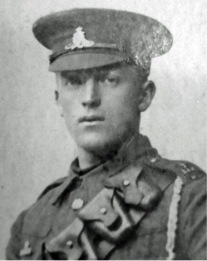 However, his Sergeant owed a favour to a fellow NCO in 7th Division and “loaned” Jack for his signalling skills as a last minute replacement on the front line near Albert on 30 June.